Leeds, UK, 27 September 2018 – BigChange, the mobile workforce management technology company, today announced the launch of Leaders for Life, a new campaign designed to turn business leaders into role models for road safety and reduce the number of people killed on Britain’s roads by people driving for work. Department for Transport today published figures today revealing that there were 1,793 reported road deaths in Britain in 2017, five a day on average, and 170,993 casualties of all severities. 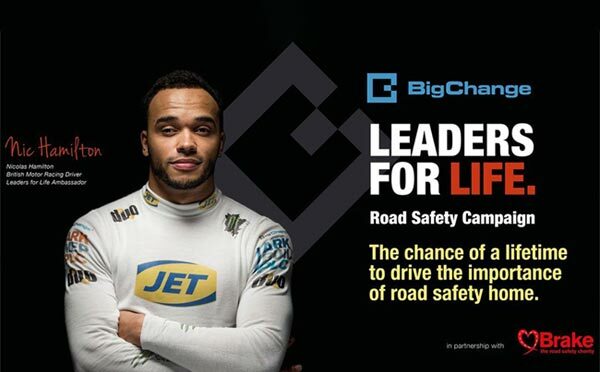 Leaders for Life was developed by BigChange in partnership with road safety charity Brake, and is supported by the racing driver Nicolas Hamilton and several prominent business leaders. BigChange is offering its driving analysis technology free of charge to the leaders of medium and large UK businesses, to help them understand how safe their driving is and take steps to improve it. BigChange is providing its driving analysis technology free of charge to business leaders so that aspects such as speed, braking, acceleration and cornering can be evaluated. It will provide confidential feedback on leaders’ driving habits and donate £1,000 each month to Brake on behalf of the best and most improved drivers. BigChange’s technology is already used to monitor the driving habits of 20,000 company drivers in the UK. Business leaders wishing to be ambassadors for safer driving can register to support the Leaders for Life campaign at https://www.bigchange.com/leadersforlife/.